Carrie Bloomston helps companies of all sizes amplify their creative thinking and (team-building) abilities through art-based, group workshops. Wake up the right side of your company’s brain and help them to see possibilities for growth. Carrie helps people from all over the world reclaim their creative spark by reconnecting with themselves. 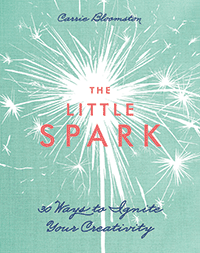 Through intimate group workshops, parties, e-courses and her book, “The Little Spark: 30 Ways to Ignite Your Creativity,” Carrie leads us towards deeper connectedness, personal growth and the creative light within. Carrie Bloomston is an artist and author at heart, and the Carrie Bloomston brand encompasses her original work in commissioned and commercial formats. Carrie creates art and design for fabric, packaging, and products. Carrie Bloomston is an artist, designer, creativity enabler and author of The Little Spark: 30 Ways to Ignite Your Creativity. Carrie offers the world opportunities to spark, support and sustain their inner creativity through her books, presentations, e-courses, group workshops and retreats. Her corporate creativity workshops promote creative approaches to problem solving in the workplace through art. The Carrie Bloomston™ brand offers design consulting services and product licensing opportunities to companies around the world. Carrie helps people from all over the world reclaim their creative spark by reconnecting with themselves. Through intimate group workshops, Carrie leads us towards deeper connectedness, personal growth and the creative light within. Check out Carrie Bloomston's ``Story`` fabric design collection. Read about Carrie and her passion of creativity in the news, on blogs and in national magazines. Are you ready to live a passionate, creative life but feel scared to even say it out loud? Do you sometimes feel sluggish, bored, stuck or uninspired? Are you ready to do something for yourself? Join us November 12-15 for the SPARK CREATIVITY RETREAT in Scottsdale Arizona!